Can a newspaper feature that ran for forty years possibly be considered an obscurity? It sure can, at least in the case of Noozie. The International Syndicate, based in Baltimore, was never really a major player, but they came to the newspaper feature syndication party quite early, in the 1890s. 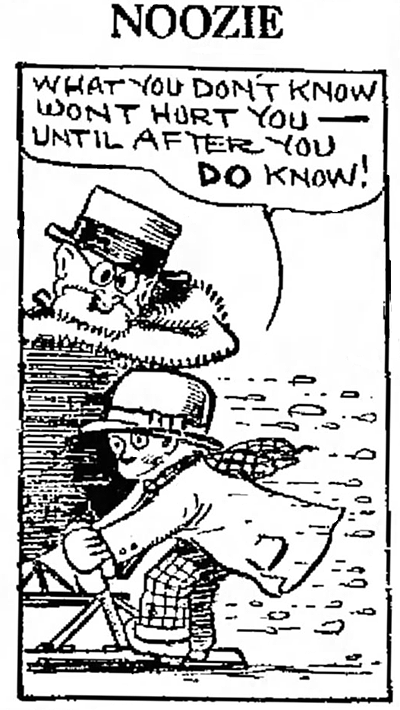 What's more, they seem to have been in the business of syndicating cartoons earlier than anyone else -- at least they occasionally made the claim of being the first syndicate to distribute cartoons. Though I have heard that International Syndicate did not incorporate until 1899, it is my feeling that the syndicate was an outgrowth of the Comic Sketch Club (also Baltimore based), which seems to have been distributing cartoons as early as 1895-96. In those early days, they specialized in small captioned gag cartoons, shying away from series of any kind. The International Syndicate never offered more than a small menu of features. In fact, after the 1920s, they seem to have been limited to a roster that included only a couple of crossword puzzles, a connect-the-dots puzzle, a few short fiction options, and Noozie. 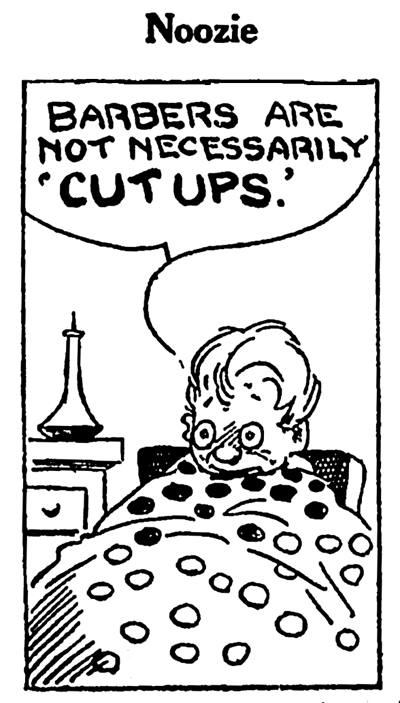 Noozie is one of those cartoons that is sometimes used as a "weather ear". What in the Sam Hill does that mean, you ask? Well, on the front page of your newspaper you have the masthead at the top middle, and the 'stuff' on the left and right are known as 'ears'. Usually one of the ears has the day's weather forecast, hence weather ear. Some papers liked to dress up their weather ears with a cartoon. This can be as simple and repetitive as a character who is covered in snow, drenched by rain, and so on depending on the forecast, or it can be new every day, and not necessarily even comment on the weather. 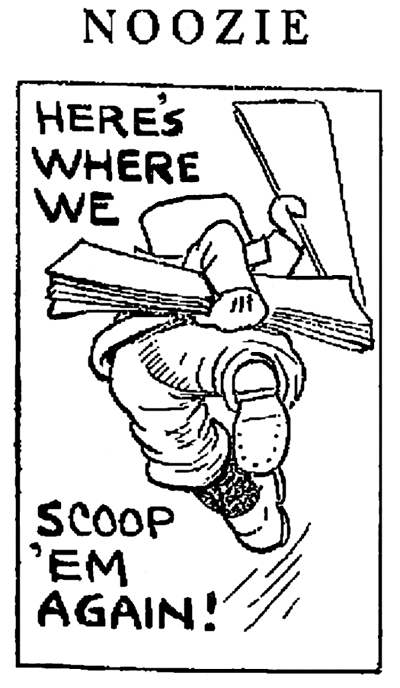 The St. Louis Post-Dispatch Weather Bird, for instance, began as a weather cartoon, then branched out into humor and editorializing. Noozie is of the same ilk, but not as strong a character as the Weather Bird. It is rarely the sort of cartoon that you have to look at for more than a second or two, usually it's just a hoary old gag, a bit of pickle barrel philosophy, or even less (like sample #2 above). Noozie was never a big seller by any means. In fact, my book says that the earliest samples I've found are from 1922. Well, that was just a bit off. Alex Jay did some looking and turned up much earlier ones, going back as far as October 1915 (in the Gulfport Herald). The question of authorship is also in the air. 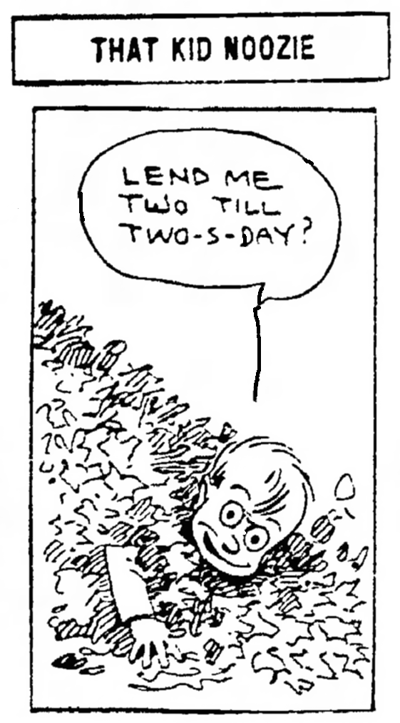 I have seen a very few of the panels signed by Frank 'Hop' Hopkins, who was a mainstay at International Syndicate in the 1910s. It seems that he most likely produced most of the panels from 1915 up to about 1919 for International Syndicate. But then Hopkins struck out on his own under the name Hop Service, and continued to offer Noozie through that company. Yet International seems to have also continued to offer the cartoon in the same period. 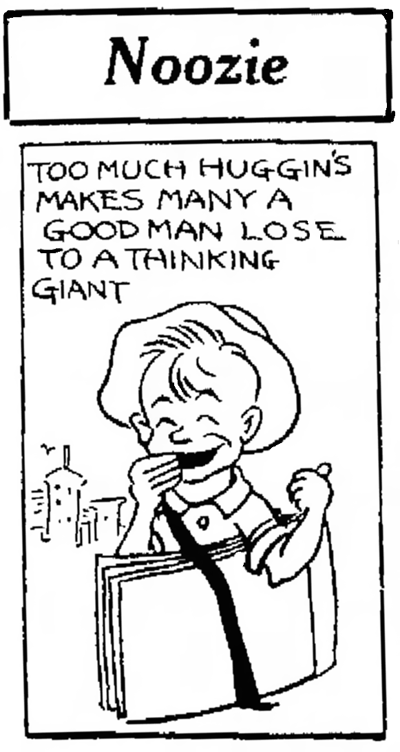 Whether International Syndicate had an arrangement with Hopkins to share his work, or if they instead found another hand to take on Noozie is uncertain.All I do know is that when Noozie was listed in the annual Editor & Publisher Syndicate Directory (which began in 1924), Hopkins was listed as the cartoonist. I guess, then, that he had returned to International Syndicate as I see no mention of Hop Service that late. But soon things went awry. In 1925, Hopkins gets the nod again. In 1926, though, a new name is listed -- Hanny. That would be William F. Hanny, slightly better known as an editorial cartoonist. Unfortunately, from 1927 on, the feature was uncredited in the E&P listing, until it finally ended in 1955. Judging by the samples I've been able to locate from later in the run, I do occasionally see evidence of other hands. And I wouldn't be too surprised if Noozie cartoons didn't also get recycled, though I have no idea how much or often. Next: Alex Jay's Ink-Slinger Profiles of Hopkins and Hanny.